Be the first to share your favorite memory, photo or story of Doris. This memorial page is dedicated for family, friends and future generations to celebrate the life of their loved one. A Bardstown resident Mrs. Doris Ann Yocum, age 84 passed away Sunday, October 28, 2018 at Flaget Memorial Hospital. 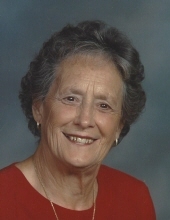 She was born on February 27, 1934 in Bardstown to the late Wood Lee and Leona Ritchie Vittitow. Doris retired after 27 years from Kroger as a meat cutter and a former employee of Ice’s Produce. She was a member of The First Cedar Creek Baptist Church. Besides her parents she was preceded in death by her husband of 40 years Thomas Woodrow Yocum, 5 brothers, Lupie, W.L., Herman Houston and James W. Vittitow, 3 sisters, Leona Vittitow, Alta Young and Geraldine Ice. She is survived by 2 sons, Woody Keith(Peggy) Yocum of Bardstown, Gary Dean(Vicky) Yocum of Botland a daughter, Phyllis Ann Yocum of Bardstown along with 7 grandchildren and 10 great grandchildren. Doris is also survived by a sister, Betty Jean Montgomery of Bardstown and several nieces and nephews. Funeral services for Mrs. Doris Ann Yocum will be 11:00am Friday, November 2, 2018 at Houghlin-Greenwell Funeral Home with interment in Bardstown Cemetery. Visitation will be Thursday, Nov. 1st, from 3:00-8:00pm at the Houghlin-Greenwell Funeral Home, 1475 New Shepherdsville Road, who is in charge of arrangements. The family request that expressions of sympathy be made to the American Cancer Society. To send flowers or a remembrance gift to the family of Doris Ann Yocum, please visit our Tribute Store. "Email Address" would like to share the life celebration of Doris Ann Yocum. Click on the "link" to go to share a favorite memory or leave a condolence message for the family.